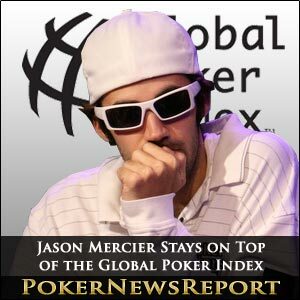 American poker star Jason Mercier has remained on top of the Global Poker Index (GPI) 300 following the introduction of an updated scoring system. The 25-year-old Team PokerStars Pro Jason Mercier ended the year 168.5 points ahead of French player Bertrand ‘ElkY’ Grospellier, but has dropped to 163.28 over fellow American Erik Seidel. With Mercier – who now has 3,015.08 points – being probably the world’s most dependable tournament player during the past three or so years, he has undoubtedly benefited from the GPI’s decision to introduce a fourth scoring result within Periods 1, 2 and 3. Eight-time World Series of Poker (WSOP) bracelet winner and Las Vegas native Seidel, meanwhile, moved up one place to second spot on the GPI with 2,851.80 points to move 46.05 clear of Triple Crown winner Grospellier (2,805.75). The top five is completed by fourth placed Ukrainian Eugene Katchalov, who has 2,656.33 points, and 888 Poker sponsored Sam Trickett (2,582.47). Neither player made any moves in the rankings, although Katchalov lost 113.49 points and Trickett dropped 100.56. It will certainly be interesting to see how these changes affect the rankings over the next few weeks as the PokerStars Caribbean Adventure started last Wednesday, as did the World Poker Tour (WPT) Ireland – which was won by Englishman David ‘Dubai’ Shallow. Additionally, the 2010 and 2011 WSOP $10,000 No-Limit Hold’em main events drop down periods, so there is every likelihood that we will witness some big changes in the GPI 300 – especially from those who finished high up in the tournaments. 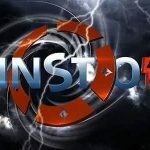 Eric Faulkner, the chief information officer with Federated Sports + Gaming (FS+G), spoke to PokerNews about the changes made to the rankings system that were introduced this week, stating that “the GPI model will be reviewed every six months and adjusted where necessary to reflect the changing landscape of live tournament poker”. With the GPI just six months old, Faulkner added that, “as promised at the outset…the first of these reviews occurs this week”. So what does that mean for the rankings? Well, with the system taking scores from six half-year phases, Faulkner stressed that “one of the key features of the GPI is the cap on results” that he believes is essential in controlling players acquiring a “high GPI score merely” because they play “a higher than average number of tournaments”. The original plan – which was set after “evaluating the average number of results per half-year period for the group of professional players defined as the individuals who qualified for The Epic Poker League (EPL)” – meant a cap was put in place that meant just three results could be included within all six periods that count towards the GPI 300. Now, however, that group of pros has been modified to reflect those players within the GPI 300 – mainly because this group is comprised of the “most active players on the tour” and so is more representative in calculating “the cap on results”. With that in mind, as well as “a general increase in live tournament play”, the GPI redefinition has seen “an increase” of one score to four in the results recorded in the first three scoring periods, although Periods 4, 5 and 6 remain stationary at three scoring results. Faulkner reckons that this change “reflects the average number of cashes for the players in the GPI 300 across the entire 36-month period that the GPI measures”. So, there you have it. It’s not a major change, but the extra weighting towards Periods 1, 2 and 3 seems reasonable. But expect some other minor modifications in six months’ time when FS+G again review their points scoring system. While there wasn’t much movement in the top five of the GPI 300, the next five places showed major changes. The biggest winners of the week was Brooklyn’s Vanessa Selbst, who moved up five places from 11 to six on 2,441.15 points. New York State’s Will ‘The Thrill’ Failla crept up the rankings from eighth place to seventh to sit on 2,432.32, while Canadian Shawn Buchanan dropped two spots to eighth on 2,430.85. American Matt Waxman moved up one spot to ninth on 2,395.23 points, while the biggest faller inside the top 10 was Canadian Sorel Mizzi, who fell three places to 10th on 2,374.73. A total of 10 players broke into the top 300, with Cincinnati’s Jacob Bazeley leading the way on 1,129.41 points in 248th place, followed by Kentucky’s Brian Powell (277th place on 1,081.56 points). Bazeley’s 130th place at last summer’s WSOP in event #48, a $1,500 No-Limit Hold’em tournament, had only ever made it into Period 2 after his complement of three Period 1 scores had excluded that result. However, with that result now counting towards his four Period 1 scores, the American pro has zoomed into the top 300. The other new entries are Brian Powell (277th on 1,081.56), Andrea Benelli (278th on 1,080.02), Maksim Kolosov (288th on 1,066.87), Dana Kellstrom (289th on 1,066.81), Humberto Brenes (291st on 1,062.05), Ted Forrest (292nd on 1,061.53), Denys Drobyna (293rd on 1,058.52), Jason Wheeler (296th on 1,053.64), and Faraz Jaka (300th on 1,047.60). The 10 players falling out of the GPI are Nick Grippo, Morten Mortensen, Michael Pesek, Max Pescatori, Matt Matros, Josh Arieh, Jesse Martin, Daniel Idema, Brian Rast and Brian Hawkins. Denver’s Rast – who won the $50,000 buy-in Poker Player’s Championship at last summer’s WSOP for $1,720,328 – fell by over 100 spots over the past few weeks with his other 2011 WSOP win in event #15, a $1,500 buy-in Pot-Limit Hold’em tournament, joining his other success in Period 2. Tucson’s Sean Getzwiller, meanwhile, enjoyed a huge leap up the rankings. The American climbed 61 places to 150th on 1,337.10 points after his 35th place in event #46 – the $10,000 buy-in No-Limit Hold’em Six-Handed Championship – at last year’s WSOP dropped into Period 2 to give him two results in that phase adding to a complement in Period 1. The other big movers are Brandon Meyers (up 50 to 163 rd on 1,292.81), Matt Stout (up 41 to 129th on 1,392.51), Barny Boatman (up 24 to 177th on 1,261.79), Vivek Rajkumar (up 24 to 197th on 1,229.76), Eric Baldwin (up 23 to 175th on 1,267.66), Per Linde (up 23 to 179th on 1,260.34), Daniel Neilson (up 23 to 180th on 1,260.31), and David Parades (up 23 to 181st on 1,258.32). There we also some huge drops in the GPI 300, with three-time WSOP bracelet winner Barry Greenstein falling 126 places to 219th on 1,196.84 points. Additionally, Florida’s Mike Binger (down 120 places to 244th on 1,134.98 points) and Anaheim’s Owais Ahmed (down 110 to 298th on 1,048.34) also suffered big drops as all three saw ageing scores from the Poker Player’s Championship last summer drop into Period 2. Greenstein, who finished in 15th place, and Binger – with a 14th-place finish – no longer have any Period 1 results, while Ahmed (fourth) only has one. The other notable losers include Daniel Reijmer (down 92 to 218th on 1,198.79), Jon Spinks (down 87 to 269th on 1,097.94), Daniel Alaei (down 86 to 206th on 1,211.30), Justin Bonomo (down 83 to 214th on 1,204.51), Jesse Alexis Cohen (down 81 to 216th on 1,201.83), Russell Carson (down 79 to 264th on 1,102.48), and Thorsten Schafer (down 75 to 217th on 1,201.06).